Last night I was looking for boxes for Christmas presents in the basement. I started moving them around and I stumbled upon my old John Milner bushing reel. I purchased it from an Ebay auction about ten years and that was when pinning was starting to take off on the Alley, especially here in Ohio. I was as green as got when came to pinning. No videos or articles to help guide me. It was all trail and error and a lot of birds nests. But, I eventually mastered it. 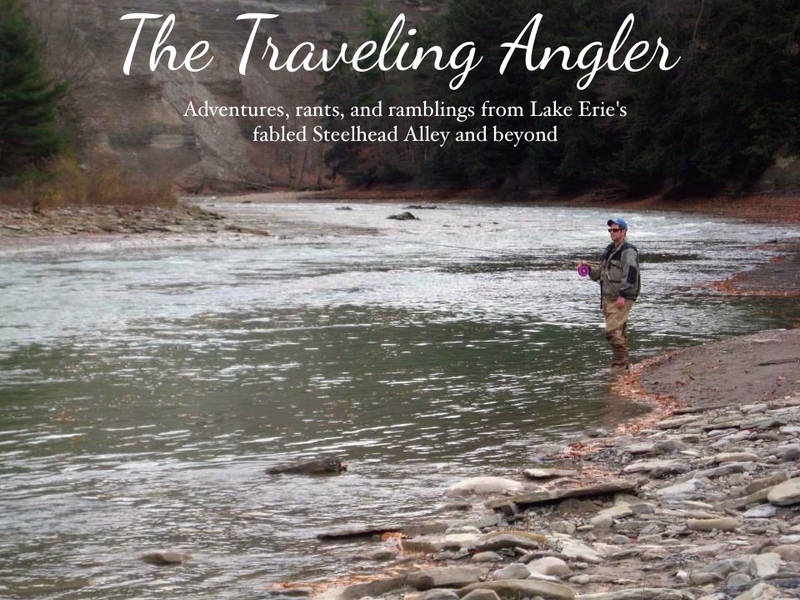 It was a well built reel, but I'm always getting the latest trends in steelheading. It was the Milner, then a Bob James and today a Kingpin. I sold the Bob James, but I could never part with the Milner. I knew John Milner only produced a handful of reels every year, but it had no serial number and I had no idea when it was made. It was tucked away but never forgotten. I took the reel out of the box and spun it. It spun for a couple of minutes despite the lack of any lubricant. It still had the old Siglon line from five years ago. I took it upstairs and replaced the line. I put a couple of drops of sewing machine oil on the bushing and spun it. It was just as quiet as the bearing reel. I rigged the reel to my G Loomis rod and I was all set for the trip out east tomorrow. I sat back and watched the latest of the never ending bowl games. Tonight it the ever popular uh oh better get MAACO bowl game. Personally I think there is way too many bowl games and some of them have the dumbest names such as the Beef O'Brady or Tax Slayer bowl - seriously. But colleges are always looking to squeeze more cash out their student athletes. It actually turned out to be a thrilling game as Boise State beat Washington 28-26. The Alley got it first taste of winter a couple days ago. It was suppose to be a major storm, but it didn't amount to anything but a light dusting here. As for the the snow belt I would find out in the morning. A cold chill greeted me as I walked out. The sky was clear and full of stars. Many of my fellow citizens were getting sleep, preparing for a day of last minute Christmas shopping and waiting for family members to arrive. Unfortunately due to work I wasn't able to get time off and it would of been to expensive to fly out to British Columbia with just days before the weekend. When I crossed into Pennsylvania, the amount of snow was much greater. I got off the exit and drove south to the creek. It was first light when I pulled in and there was a couple cars. I watched all four of them head downstream and I immediately headed up. I walked along the creek and checked the temperature, it was 27F. There was ice along the stream and some slush in the water. The surrounding forest and cliffs were cloaked in fresh snow. The creek was running clear and the deeper water was emerald green. 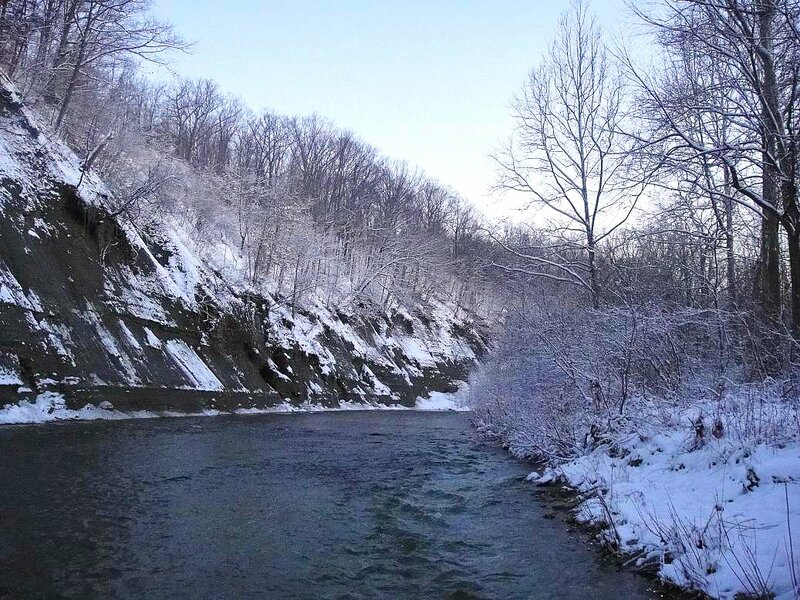 It was winter steelheading at its finest. The best place to be was the monster pool farther up stream, but with nobody around I wasn't in an hurry. The water was probably in the mid 30s and that meant tailouts and slicks. 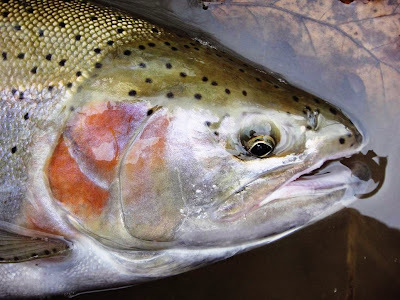 With it being this late in the season and farther up river, nearly all of the fish were dark, post spawn and dropping back. Unlike the fresh fish of Ohio I caught before the last blowout, all of the Pennsylvania fish had a palette of charcoal, reds and whites. The highlight of the morning was the yuletide log that I hauled out of one hole. It was the lightest of takes as the float barely hesitated. It was truly a pig and just as fat as one. He was in his winter glory with the brightest of colors. I guess he also garnered a lot of attention as he about five flies stuck in him. I removed all of them and took a couple of quick pictures. I gently placed him in the frigid water and I watched slowly sulk off into the depths. 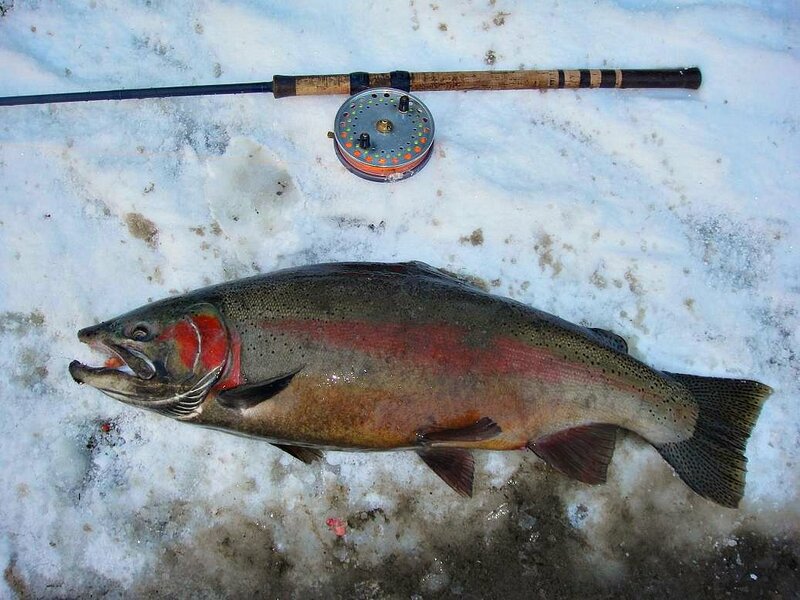 The frigid temperatures made fishing challenging as the line and guides constantly iced up. I remembered not to whack the rod in the water as I learnt my lesson from last winter. The fishing was mundane as best as I picked away at them. They weren't piled into the few holes but scattered through out. The sun slowly crept up through the trees and I started to feel the warmth. It was mid morning I had yet to see a person out which is a blessing on the Elk. I started the long trip back downstream and as I got closer to the access, I started to see people. Groups of the them were clustered around the holes I fished earlier in the morning. In the distance I could make out 8 cars and trucks. I could of made the trip downstream but instead I wanted to head to another stream. That stream was my little secret. It's a small gem that I get to rarely fish anymore. I arrived to see not one person out. This stream practically runs over shale. The bottom is pockmarked full of small holes. Along those holes are the shale ledges. The ledges provide with little cover for the fish. It was partly cloudy and whenever the sun came out, the ledges could be seem very easily. I fired the float across and moved it into the heart of the hole. The float shot under and from a distance I could see the side of steelhead flash as it took the bait. Unlike Pennsylvania, the majority of fish caught here were fresh. Every little hole yield some fish. It was three before I hit the road and I-90 was more busy for a Sunday. A lot of people travelling including fellow Canadians. I stopped for a coffee and took my time driving home. I was in no hurry as all of my Christmas shopping was done weeks ago. The couch was calling my name when I arrived home. I flopped down and put on the game. I covered myself in the blanket and quickly fell asleep. Tomorrow will be a slow day and I'm sure the boss will close shop by noon. That will give me some time to scout the Rock out for the annual Christmas outing with the boys.